This recipe can be changed up according to what you have on hand. 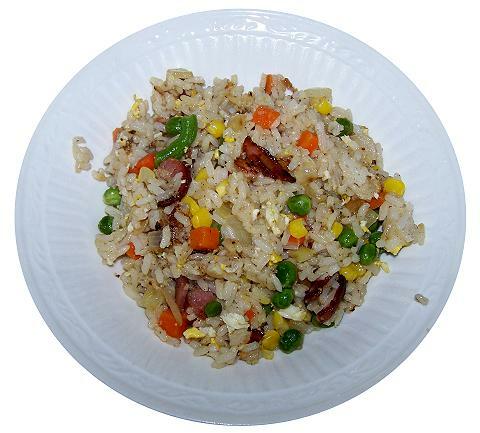 It’s made with 3-cups of leftover, cooked rice. If you cook 1-cup of dry rice, then you’ll wind up with 3-cups cooked rice. My kids like it best made with pork bacon, but I prefer turkey bacon and a tablespoon of vegetable oil. If you have leftover meat or tofu you want to use up, then you can add pretty much any type you have on hand. I’ve made it with 4 slices of chopped baloney, a couple of sliced hot dogs, leftover chicken, half a block of tofu, or a couple of beaten eggs. It’s good with SPAM too. In this case you can leave out the bacon since SPAM is pretty salty all on it’s own. Half a can of SPAM is plenty. Optional: 2 eggs-beaten or tofu, chicken, beef, pork, ham, sliced hot dogs etc., about 1-cup chopped into bite-sized pieces.